When I first started losing weight, I followed everything in the Forks Over Knives movie, and believed that meat gave you cancer. I proudly called my diet “plant-based”, and told a few people that “I’ve finally found the way I was born to eat.” I even tried to convert a friend to a plant-based diet, who politely listened to me for an hour. But one of the first things you learn about your lifestyle transformation, is that unless you can guarantee amazing results with no effort, people don’t want to hear about it. It’s just a lecture. That’s one of the first signs that you’re in a diet cult. Sure, people don’t want to listen because they don’t want to make an effort to lose weight, but also because they don’t want to hear yet another faddish set of arbitrary dietary rules. So while I’m attracted to the extreme high-concept diets in theory, I’m actually practical enough to tone it down for everyday life. I realised eating butter, oil, fish, and meat wasn’t going to kill me. So my current diet is somewhat flexible, but is starch-based with small amounts of meat, lots of vegetables, and probably 30% of calories from fat. 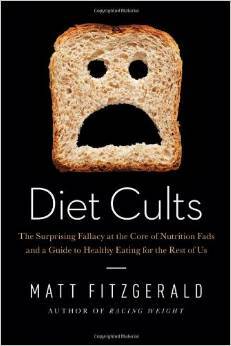 I’m hoping it falls under what Matt Fitzgerald calls healthy agnostic eating in his recently released Diet Cults. The book is a fun read, especially if you’re obsessed about diet and nutrition, and want to understand our natural tendency to judge other people’s dietary preferences, and why we otherwise attach ourselves to particular diets. The overall message is reasonable, and re-assuring. We’ve evolved over millions of years as omnivores, and individuals today can adapt and thrive on almost any kind of diet. Fitzgerald’s chapter on how the 1804 Lewis & Clark expedition ate off the land for 2 1/2 years is fascinating. Of course, people want to believe in gimmicky diets, demonize certain foods, and heal with superfoods. But Fitzgerald’s chapter on the National Weight Control Registry (database of people who have lost 30 lbs, and kept it off for a year) show what really works for weight loss: motivation. It’s the only thing that matters, and people will chose the diet that works for them. Motivation trumps will-power (self-control), and anyone that really wants to, will lose the weight and keep it off (through 1hr/day exercise). Don’t believe anything else.